A major barrier to rapidly mobilizing adaptation funds is the lack of a common platform for fund managers and project proponents to explore possible projects, learn from each other, and identify capacity strengthening needs. The USAID Adapt Asia-Pacific programme (2011-2017) integrated knowledge transfer, capacity building and technical assistance to link climate funding organizations with eligible Asia-Pacific countries and help prepare projects that increased resilience to the negative impacts of climate change. ADAPT Asia-Pacific Annual Forums aim to provide discussion sessions, trainings and an innovative face-to-face "development marketplace." They also aimed to enhance understanding of available climate funding resources and the associated requirements for accessing them. Proceedings from the ADAPT Asia-Pacific Annual Forums can be found below. 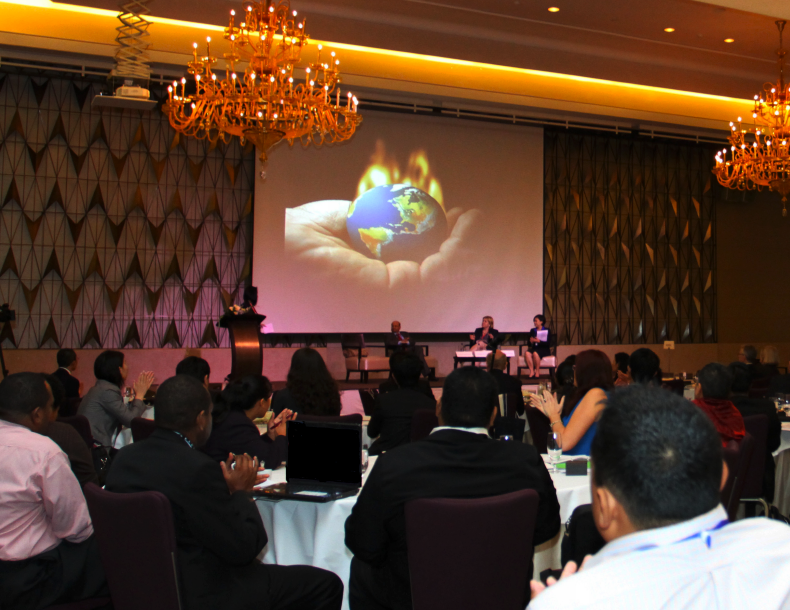 The ADAPT Asia-Pacific 1st Annual Forum was held on March 13-15, 2012 in Bangkok, Thailand. It was convened to facilitate access to international climate change adaptation fund allocations by governments in the Asia-Pacific region. The Forum provided a platform for discussion on financing climate change adaptation, available adaptation funds and access to capacity building and technical assistance. The ADAPT Asia-Pacific 1st Annual Forum also facilitated the building of partnerships for mutual benefit and knowledge sharing. Approximately 120 participants representing government institutions from more than 20 Asian and Pacific Island countries, representatives of key climate change funds (Adaptation Fund, the Least Developed Country Fund, the Special Climate Change Fund, the Climate Investment Funds, and the Global Climate Change Alliance), multilateral institutions (UNEP, UNDP, ADB, WB) and bilateral donor (JICA and AusAID) met at the ADAPT Asia-Pacific Forum to discuss how governments can compete more effectively for international climate change adaptation funds. This final report reviews the proceedings and the key outcomes of the Forum. It also highlights some of the main points within the highly productive presentations and discussions. The USAID Climate Change Adaptation Project Preparation Facility for Asia and the Pacific (ADAPT Asia-Pacific) 2nd Annual Meeting was held on 3-4 June 2013 in Nadi, Fiji, in collaboration with the Pacific Islands Forum Secretariat (PIFS) and Secretariat of the Pacific Regional Environment Programme (SPREP). This second regional meeting was part of the first-ever “Pacific Climate Change Resourcing Event Week” under the auspices of Pacific Climate Change Roundtable (PCCR) Resources Working Group (RWG) and supported by UNDP, USAID and AusAID. The event followed a three-day Pacific Climate Change Financing Workshop (30 May – 1 June 2013) in Nadi, Fiji. Together the combined events sought to improve Pacific Island Countries’ (PICs) access to funds that would help finance their vital climate change adaptation projects. Around 110 participants attended the meeting – comprising officials from 14 PICs. Government officials from 21 countries across the Asia-Pacific region, along with development partners, met at the USAID Adapt Asia-Pacific Third Annual Forum on September 15-16, 2014 in Siem Reap, Cambodia, to promote regional cooperation and knowledge exchange on Strengthening Country Systems to Access and Manage Climate Change Adaptation Finance in Asia and the Pacific. During the two-day Forum, country delegates identified specific national and regional priorities to strengthen their country systems – including the need to improve country capacities to develop stronger, more robust project proposals – to better access and manage climate change adaptation finance. The Forum, organized in partnership with the United Nations Development Programme (UNDP), provided a space for delegates to engage in country-led roundtable discussions where participants exchanged on-theground experiences that have helped strengthen different aspects of a country systems to attract, access, manage, and report on climate finance from multiple channels through multiple modalities. These experiences included: climate-sensitive policy development in Bhutan; economic appraisal of adaptation projects in Thailand; climate finance budget tracking in Nepal; monitoring of climate resilience investments in Samoa; and others. Around 100 participants attended the USAID Adapt Asia-Pacific Third Annual Forum in Siem Reap – comprising officials from 17 Asian governments. Four Pacific Island Countries (Cook Islands, Republic of Marshall Islands, Samoa, and Vanuatu) also participated. Other representatives who attended included eight development partner organizations (100 Resilient Cities, ADB, GIZ, ICLEI, IFC and PIFS), representatives of vertical funds such as the Adaptation Fund and Green Climate Fund (through video conference), as well as numerous technical resource persons from USAID and UNDP. The SIDS’ tourism sector is threatened by climate change and high adaptation costs. Through industry stakeholders, this study explores the potential of tourism to finance its own CCA.